The team argued twice on Thursday evening in the preliminary rounds. Coming out of those rounds, the team advanced to the sweet sixteen seeded number one — a testament to the high quality of both their brief and their oral arguments. On Friday, the team advanced to the elite eight, and when the teams were reseeded, the Wake Forest Law team again came out as the number one seed. After one more argument Friday, the team made it to the final four after a lively round against Seton Hall. On Saturday morning, the team competed against a team from the University of Mississippi School of Law, whose advocates chose to deliver their argument without taking any notes to the podium. While the judges complimented both teams on an excellent round, they uniformly commented that judges usually prefer a dialogue with the advocates, where questions can be asked freely, instead of a rehearsed speech, where the judges feel that they are interrupting when they want to ask a question. Based on the judges’ comments, it seemed likely that if the round had been scored head to head, the Wake Forest Law team would have advanced to the finals. However, because the scoring was cumulative, neither Wake Forest Law nor Mississippi advanced — instead, both teams in the other semi-final advanced, with Louisiana State University School of Law defeating Seton Hall University School of Law for the championship. 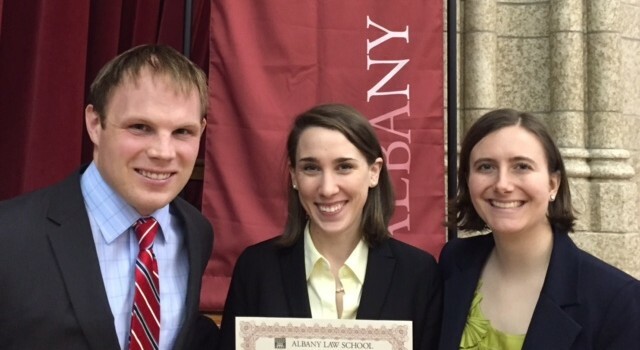 The Gabrielli Family Law Moot Court Competition draws teams from across the country. This year, more than 20 teams competed from the following law schools: Brooklyn Law School, City University of New York School of Law, Florida Coastal School of Law, Florida State University College of Law, Indiana University Maurer School of Law Louisiana State University Hebert Law Center, Michigan State University College of Law, New York Law School, Quinnipiac University School of Law, Seton Hall University School of Law, University of Baltimore School of Law, University of Mississippi School of Law, University of North Dakota School of Law, Wake Forest University School of Law, Widener University—Commonwealth Law School, Widener University—Delaware School of Law and William and Mary Law School. This year’s hypothetical problem centered on a young child whose biological father sought to establish paternal rights against the wishes of the child’s two mothers. The biological father had agreed to donate his sperm so the mothers could have a child through artificial insemination, and the mothers had allowed him to visit the child regularly and develop a bond with him. When the relationship between the mothers and the biological father soured, the mothers refused to allow him to see the child, and he sued to establish paternity so that he could pursue visitation rights. The legal issues were whether the jurisdiction’s artificial insemination statute barred the biological father from seeking to establish paternity and, if not, whether under the jurisdiction’s three-parent statute, it was in the child’s best interest to allow the biological father visitation with the child. The team is very grateful for all the support it received from students and faculty members who judged practice arguments. The team felt exceptionally well-prepared to field questions thanks to these rigorous practice rounds. Student judges were two Gabrielli alums, Woody Angle (JD ’16) and Carrie Daniel (JD ’17). Faculty judges were Dean Suzanne Reynolds (JD ’77) and Professors Curry, Eggert, Garland, Green, Korzen, Mewhinney, Morrow, Taylor, and Walker.